Funds for Treating Individuals with Mental Illness: Is Your State Naughty or Nice? New study reveals dramatic eight-fold difference in percentage of state funds allocated to helping mentally ill. The most generous states for mental health are Maine, Pennsylvania and Arizona. The stingiest states are Arkansas, West Virginia, Idaho, Kentucky, Oklahoma, Louisiana and Delaware. (New York, NY, December 12, 2017) Mental Illness Policy Org released the first study to rank all fifty states based on the percentage of state-controlled funds each state spends on mental illness. States that spend a higher percentage of their budget on mental illness are ranked as generous and those that spend a lower percentage are ranked as stingy. This study found the most generous states in mental health spending are Maine, Pennsylvania and Arizona. The stingiest states are Arkansas, West Virginia, Idaho, Kentucky, Oklahoma, Louisiana and Delaware. 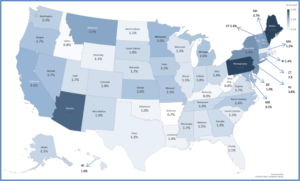 The most generous states, Maine and Pennsylvania (5.6%), allocates eight times more as a percentage of total state spending than the stingiest state, Arkansas (.7%).